AO-40 is an Amateur satellite that was active between 2000 and 2004. It had several transponders and beacons covering many bands from HF to microwave and its position on a HEO orbit provided several consecutive hours of coverage each day and allowed long distance contacts. Since then, many interesting things have happened with Amateur satellites, particularly the high increase of the number of cubesats that is happening over the last few years, but even so, we haven’t seen again any other satellite with the characteristics of AO-40 nor it is to be expected in the near future. I was quite young when AO-40 was operational, so for me this is all history. However, Pieter N4IP has posted recently on Twitter some IQ recordings of AO-40 that he made back in 2003. 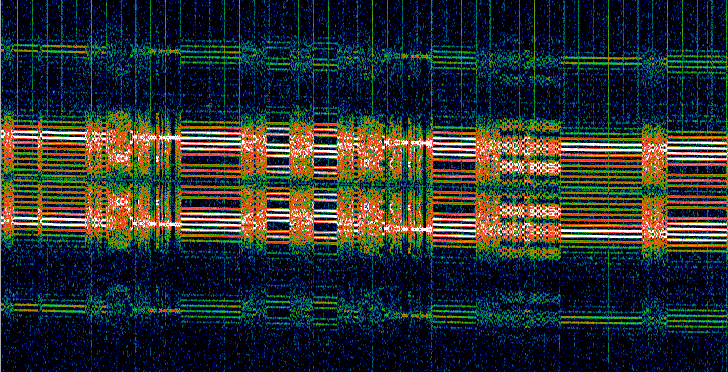 I have been playing with these recordings to see how AO-40 was like. One of the things I’ve dong is to write my own telemetry decoder using GNU Radio. AO-40 transmitted telemetry using 400bps BPSK. There were two modes: an uncoded mode which used no forward error correction and an experimental FEC mode proposed by Phil Karn KA9Q. The FEC mode was used later in the FUNcube satellites, and I’ve already talked about it in a previous post. The beacon in Pieter’s recordings is in uncoded mode. Here I describe this mode in detail and how my decoder works. 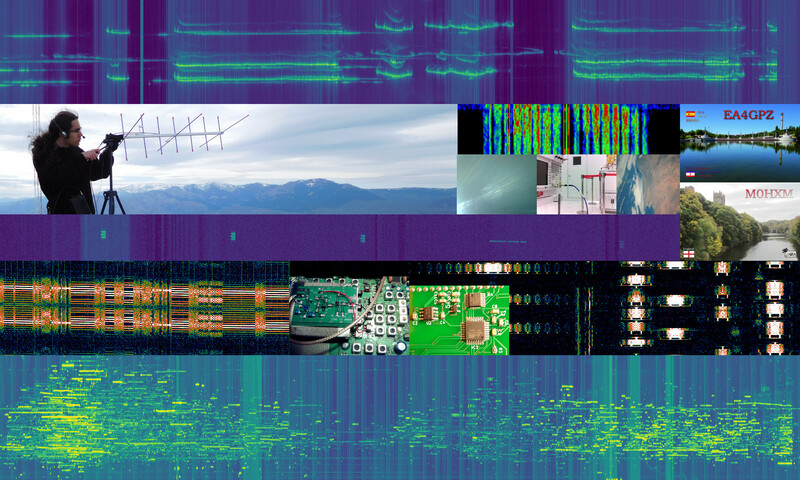 The decoder and a small sample taken from Pieter’s recordings have already been included in gr-satellites. In August last year I started my gr-satellites project as a way to make my experiments in decoding Amateur Satellite telemetry easier to use for other people. Since then, gr-satellites has become a stable project which supports 17 satellites using several different protocols. However, as time has gone by, I have been adding functionality in new GNU Radio OOT modules. Eventually, the core of gr-satellites depended on 5 OOT modules and another 7 OOT modules were used for each of the satellite families. This makes gr-satellites cumbersome to install from scratch and it also makes it difficult to track when each of the OOT modules is updated. gr-aausat, because it doesn’t use libfec for FEC decoding, and includes its own implementation of a Viterbi and RS decoder. Eventually I would like to modify gr-aausat to make it use libfec and include it into gr-satellites. beesat-sdr, because it is actively developed by TU Berlin and I have collaborated some code with them. Also, the implementation of the decoder is quite different from everything else in gr-satellites. gr-lilacsat, because it is actively developed by Harbin Institute of Technology and I have collaborated some code with them. However, as I explained in a previous post, the FEC decoding for these satellites is now done very differently in gr-satellites in comparison to gr-lilacsat, as I have replaced many custom blocks by stock GNU Radio blocks. I will have to examine carefully how much code from gr-lilacsat is actually needed in gr-satellites. The refactored version is already available in the Github repository for gr-satellites. Users updating from older versions should note that gr-satellites is now a complete GNU Radio OOT module instead of a collection of GRC flowgraphs, so it should be built and installed with cmake as usual (see the README). The GRC flowgraphs are in the apps/ folder. The OOT modules that have been included into gr-satellites will be deprecated and no longer developed independently. I will leave their Github repositories up with a note pointing to gr-satellites. Use cmake to build and install hierarchical flowgraphs, saving the user from this cumbersome step. Use cmake to build the python scripts associated to the decoders. Collect in a Git submodule the sample WAV files that are scattered across the different OOT modules. Add WAV samples for missing satellites. Use these WAVs to test decoders, perhaps even with some automation by a script. And of course, there are many QB50 project satellites being launched starting next week. I’ll try to keep up and add decoders for them, especially for the ones using not so standard modes. I already have a working decoder for Duchifat-2, since I have been collaborating with their team at Herzliya Space Laboratory. I will also adapt the LilacSat-1 decoder from gr-lilacsat. This decoder has already been featured in this blog.